Ready to tickle your funny bone? 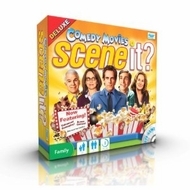 With Scene It 8194 Comedy Movies Deluxe from Today’s Concept, enjoy trivia from hundreds of popular comedy movie selections. In addition, this DVD-based game is perfect for playing with a partner or with a crowd. Enjoy questions scanning observation, memory word play, and problem solving. This set includes a Game DVD, Flextime Game Board, Shuffle Play feature, 4 Collectible Metal Tokens, 160 Trivia cards, 20 Buzz cards, 1 Six-Sided die, 1 Eight-Sided Die, Instruction Sheet, and a New Enhance Gameplay feature. Get ready to become competitive and laugh out loud with Scene It 8194 Comedy Movies Deluxe from Today’s Concept! Get ready to tickle your funny bone with Comedy Movies Scene It? Deluxe Edition. Recommended for ages 13 and older, this DVD trivia game features hundreds of questions about your favorite comedic moments. Comedy Movies Scene It? also challenges your observation, memory, wordplay, and problem solving skills as you try to decode special DVD puzzles. Designed for two or more players, this trivia game is ideal for those with both a sense of humor and a competitive streak.